The spelling টেমপ্লেট:Sqc, indicating the pronunciation [aˈgʊs.tʊs], occurs in inscriptions (Allen 1965, পৃ. 61). ↑ The final name of Augustus, Imperator Caesar Divi Filius Augustus, means "Commander Caesar, Son of the Divine, the Venerable". Bivar, A. D. H. (1983). "The Political History of Iran Under the Arsacids", in The Cambridge History of Iran (Vol 3:1), 21–99. Edited by Ehsan Yarshater. London, New York, New Rochelle, Melbourne, and Sydney: Cambridge University Press. আইএসবিএন ৯৭৮-০-৫২১-২০০৯২-৯. Brosius, Maria. (2006). The Persians: An Introduction. London & New York: Routledge. আইএসবিএন ৯৭৮-০-৪১৫-৩২০৮৯-৪ (hbk). Dio, Cassius. (1987) The Roman History: The Reign of Augustus. Translated by Ian Scott-Kilvert. London: Penguin Books. আইএসবিএন ৯৭৮-০-১৪-০৪৪৪৪৮-৩. Eck, Werner; translated by Deborah Lucas Schneider; new material by Sarolta A. Takács. (2003) The Age of Augustus. Oxford: Blackwell Publishing (hardcover, আইএসবিএন ৯৭৮-০-৬৩১-২২৯৫৭-৫; paperback, আইএসবিএন ৯৭৮-০-৬৩১-২২৯৫৮-২). Eder, Walter. (2005). "Augustus and the Power of Tradition", in The Cambridge Companion to the Age of Augustus (Cambridge Companions to the Ancient World), ed. Karl Galinsky, 13–32. Cambridge, MA; New York: Cambridge University Press (hardcover, আইএসবিএন ৯৭৮-০-৫২১-৮০৭৯৬-৮; paperback, আইএসবিএন ৯৭৮-০-৫২১-০০৩৯৩-৩). Everitt, Anthony (2006) Augustus: The Life of Rome's First Emperor. Random House Books. আইএসবিএন ১-৪০০০-৬১২৮-৮. Gruen, Erich S. (2005). "Augustus and the Making of the Principate", in The Cambridge Companion to the Age of Augustus (Cambridge Companions to the Ancient World), ed. Karl Galinsky, 33–51. Cambridge, MA; New York: Cambridge University Press (hardcover, আইএসবিএন ৯৭৮-০-৫২১-৮০৭৯৬-৮; paperback, আইএসবিএন ৯৭৮-০-৫২১-০০৩৯৩-৩). Suetonius, Gaius Tranquillus (২০১৩) । Thayer, Bill, সম্পাদক। The Lives of the Twelve Caesars। J. C. Rolfe, trans.। University of Chicago। Original publisher Loeb Classical Library. Southern, Pat. (1998). Augustus. London: Routledge. আইএসবিএন ৯৭৮-০-৪১৫-১৬৬৩১-৭. Everitt, Anthony. The First Emperor: Caesar Augustus and the Triumph of Rome. London: John Murray, 2007. আইএসবিএন ৯৭৮-০-৭১৯৫-৫৪৯৫-৭. Galinsky, Karl. Augustan Culture. Princeton, NJ: Princeton University Press, 1998 (paperback, আইএসবিএন ৯৭৮-০-৬৯১-০৫৮৯০-০). Levick, Barbara. 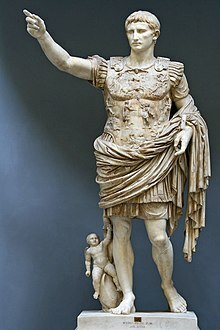 Augustus: Image and Substance. London: Longman, 2010. আইএসবিএন ৯৭৮-০-৫৮২-৮৯৪২১-১. Jones, A. H. M. "The Imperium of Augustus", The Journal of Roman Studies, Vol. 41, Parts 1 and 2. (1951), pp. 112–119. Jones, A. H. M. Augustus. London: Chatto & Windus, 1970 (paperback, আইএসবিএন ৯৭৮-০-৭০১১-১৬২৬-২). Osgood, Josiah. Caesar's Legacy: Civil War and the Emergence of the Roman Empire. New York: Cambridge University Press (USA), 2006 (hardback, আইএসবিএন ৯৭৮-০-৫২১-৮৫৫৮২-২; paperback, আইএসবিএন ৯৭৮-০-৫২১-৬৭১৭৭-৪). Raaflaub, Kurt A. and Toher, Mark (eds.). Between Republic and Empire: Interpretations of Augustus and His Principate. Berkeley; Los Angeles: University of California Press, 1993 (paperback, আইএসবিএন ৯৭৮-০-৫২০-০৮৪৪৭-৬). Reinhold, Meyer. The Golden Age of Augustus (Aspects of Antiquity). Toronto, ON: Univ. of Toronto Press, 1978 (hardcover, আইএসবিএন ৯৭৮-০-৮৯৫২২-০০৭-৩; paperback, আইএসবিএন ৯৭৮-০-৮৯৫২২-০০৮-০). Southern, Pat. Augustus (Roman Imperial Biographies). New York: Routledge, 1998 (hardcover, আইএসবিএন ৯৭৮-০-৪১৫-১৬৬৩১-৭); 2001 (paperback, আইএসবিএন ৯৭৮-০-৪১৫-২৫৮৫৫-৫). Zanker, Paul. The Power of Images in the Age of Augustus (Thomas Spencer Jerome Lectures). Ann Arbor, MI: University of Michigan Press, 1989 (hardcover, আইএসবিএন ৯৭৮-০-৪৭২-১০১০১-৬); 1990 (paperback, আইএসবিএন ৯৭৮-০-৪৭২-০৮১২৪-০).